Sign up and receive Property Email Alerts of Houses for sale in Bashewa A H, Bronkhorstspruit. 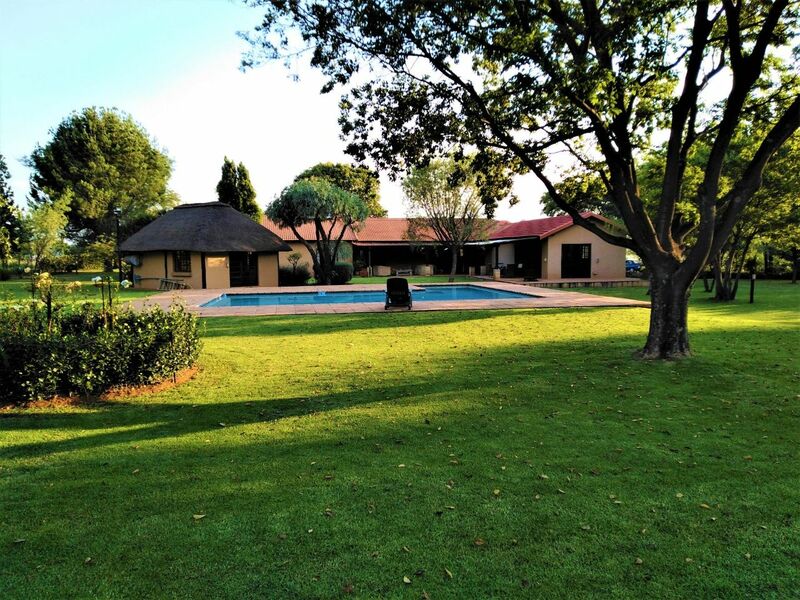 A Wonderful Home in countryside surroundings just a few kilometres from Mooikloof & The Hills! Nature creates the Music in this 'Gracelands Drive' property! When one thinks 'plot' then you will always be surprised at the classiness of this great property! From the moment the electric gates open and you wind your way up the neat gravel driveway, you realise that this property is cared for with passion! A lot of time and effort has been spent to transform the veld and humble farmhouse, into what you see today. Electric fencing and very effective lighting, secure the Expansive lawns and many large trees that enfold the 2.2 hectare manicured living section. The irrigated, wilder 2 hectares next door has an earth dam and surprisingly, the remnants of a small moto-X track carved into the veld, once used by the owners children. The Main house has 4 bedrooms & 3 bathrooms, all en-suite. The main bathroom has underfloor heating for the chilly winter days. Solar power & gas geysers supply all the hot water you need to keep you singing! All water is supplied from two 10,000 litre tanks with LOTS of pressure from the shallow borehole! For relaxation or entertaining, there is a choice of lounges (with fireplace), a study, TV room, dining room & bar! Food is prepared in a chef style kitchen with pantry, scullery and lots of storage space. A 'larger than standard' sparkling pool, just off the covered patio, is very inviting and the expansive laws that encompasses the home, is ideal for kids of all ages to enjoy. The separate, thatched pool/storeroom can be used for a variety of activities. The stand-alone 300 square metre 'clubhouse', has a large open plan entertainment and bar area, a dinning room section & kitchenette. that special guest or family member, there is an additional bedroom with on suite bathroom at their disposal. The domestic quarters have 2 bedrooms, 2 bathrooms & shower plus a lounge area. There are 2 garages with electric tip-up doors, 2 carports and a whopping Storage/Warehouse/Factory of 200 m² with its own entrance. This certainly completes this Superb Country-Lifestyle Package! Bring the family and come and see for yourself. Call me anytime for an appointment to view. Sign-up and receive Property Email Alerts of Houses for sale in Bashewa A H, Bronkhorstspruit.